Le Bon Vivant Restaurant is located in a pretty side street in the historic heart of Franschhoek. 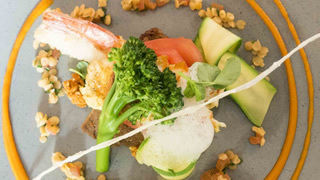 Set in a converted house in central Franschhoek, the atmosphere at Le Bon Vivant is homely and relaxed, while reminiscent of contemporary French restaurants. The glass wall allows you to see Pierre Hendriks and his team at work. Tables are also available in the shaded Le Bon Vivant garden for lunch and dinner on warm summer evenings. The food at Le Bon Vivant is an experience. Passionate about palate perfection and impeccable presentation, chef-patron Pierre Hendriks invite you on a journey of bold flavours and combinations. Chef-patron Pierre Hendriks started cooking at the age of 15, and after working in restaurant kitchens in the Netherlands for 10 years, he decided to settle in Franschhoek while on a visit to South Africa in 2001. Pierre aims to surprise, but at the same time is very aware of the high standards that are expected from a restaurant of Le Bon Vivant’s reputation. In addition to the full a la carte menu, Pierre also offers a five-course “surprise” menu which takes the form of smaller “tasting” courses, both complemented with a well-chosen wine list.